Doing Vajrasattva retreat is not simply about reciting the mantra and saying some prayers. It is about making the practice effective for your mind, making it the quickest, most powerful way to transform your mind. This book is an edited transcript of Lama Zopa Rinpoche's teachings at a three-month Vajrasattva retreat held at Land of Medicine Buddha, USA, from February 1 to April 30, 1999. 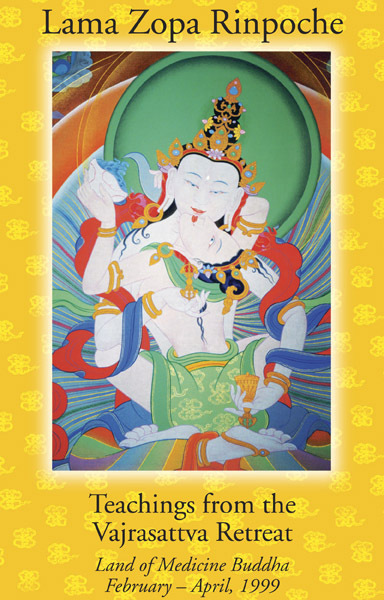 The teachings cover many lam-rim topics, purification practices, mantras, pujas and more. Teachings From the Vajrasattva Retreat had been out of stock in the US for some time, but we recently received some copies of the original version (not revised.) You can order a copy of this original version for a discounted price by clicking the Add to Cart button above. Or, you can order a Print-on-Demand version of the newly revised and updated version directly from Amazon's Print-on-Demand service. You can also download a free PDF or visit your favorite ebook vendor using the links below. LYWA Members can download the ebook for free from the Members Area.